Author Seth Godin posts a blog entry titled: “The Places You Go.” He states that our emotions are like rooms in a house that we often times freely choose to visit. We received a postcard from our school system informing us of the school bus number and pick up and drop off times for this school year for my 9 year-old daughter. A redistricting of our schools takes effect this year and my daughter and I had some fun trying to guess which of her former classmates would be on this year’s bus with her as they make their daily drive to discovery and learning. She was quick to vote a bully off her bus and prayed that a couple of friends received the same postcard today. We had fun choosing and now we’ll wait and see if our bus forecast was accurate. At work, we managers and leaders often talk of “having the right people on the team bus.” The company I work for firmly believes in always having a diverse mix of the best possible people on our corporate bus. It’s by no means a free-ride. You earn your ticket daily through individual world-class performance. Not everyone gets to go along for the ride. Some people choose to get off at a stop and others are asked to give up their seat to make room for a more capable corporate player. What if we each are driving our own life school bus? Some of us might be faithful enough to seek some Divine direction regarding our route. All of us get to choose who and what gets on and stays on our life bus. Rule 2: Your bus runs on time. This short sentence has a lot of truth to it and can have many meanings. First, you are always right on schedule. You are exactly where you are supposed to be, because that’s where you are. The fuel your bus runs on is TIME. Your tank is full at birth. Sorry, but there are no fueling stations along your way. You’ll have to see how far you can drive on the time you have been given. You never know when you will run out for sure, but when you do, you will do so right on schedule. When you run out of time, your trip ends at the final destination we are ultimately all headed towards, right on time. Your life’s speedometer is true. It shows your miles per hour. Rule 3: You cannot control the length of your life’s trip. It ends when you do. You can take good care of your life’s bus and make sure it stays healthy through scheduled maintenance (exercise, good foods, enough sleep, etc.). Good maintenance and safe driving habits might actually help you get more miles per hour. Some replacement parts might be available, but it’s better to keep your bus in great shape, so that you can make a long and safe trip. Rule 4: Family typically gets a free seat on your life bus, but you get to choose where they sit. 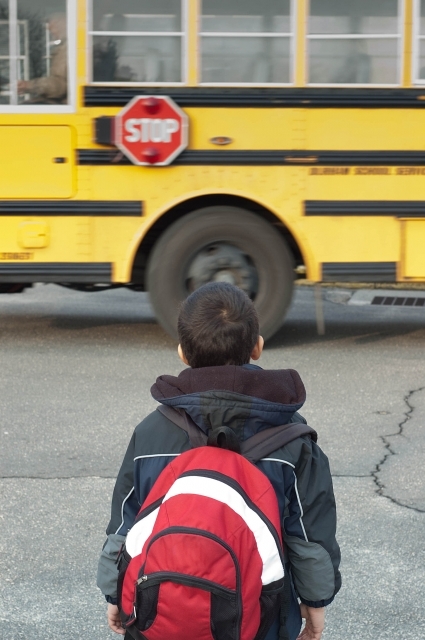 Moms and Dads must stay behind the yellow line while the bus is in motion once you trade-in your learners permit for your adult license. Keep your parents close by as long as you can. They may have been down quite a few of the roads you’ll consider taking and might keep you from going down a dead end street. Rule 5: You get to choose who else you take along for your life’s ride. Choose wisely, because once someone is on your bus, it’s sometimes hard to get them off again. Choose great singers and laughers. They make the trip more enjoyable for everyone. Any open seats are a waste, so be sure to invite a lot of friends along for your ride. Rule 6: Post your bus rules at the front of the bus where everyone can see them, including you. Follow your rules! No hitting. No disrespecting. A great list of ten rules can be found in a book called Exodus. Rule 8: When you get lost, you can and should stop and ask for directions from trustworthy guides. Since there are no time fueling stations, I like to stop at churches for help along the way. Where you stop is up to you, but remember, your engine is always running. I’d advise you not to stop at bars, since drinking and driving is against the law and will jeopardize your whole bus and all of your passengers. Rule 9: Follow the rules of the road and watch out for signs. The Creator of life’s roadways has chosen to mark many paths with signs to help you on your journey. Watch out for Wrong Way, Do Not Enter, STOP, and Dead End. Pay attention to YIELD and take the time to explore many of the marked attraction signs along the way. Rule 10: Watch your speed. This life is not a race. It can be a journey to discovery on a very scenic route of your choosing. Don’t get so focused on your final destination that you miss the beauty and amazing sites your trip has to offer. Also, be sure that you enjoy the company of your fellow travelers. The people we take this life’s trip with make the trip worth taking. Rule 11: Don’t over-pack. It’s best to travel with as light of a load as possible. There’s no storage room for negativity, guilt, anger and bad memories on your bus. Leave them behind. I suggest that you pack a cooler full of passion and a wonderful non-alcoholic drink called the “Fruits of the Spirit.” It contains equal parts: love, joy, peace, patience, kindness, goodness, faithfulness, gentleness and self-control. It’s very refreshing on a long life trip. Rule 12: Keep driving! Life’s storms, accidents and other bad drivers await you on the road. Keep driving as long as you can and many times, you’ll find sunshine again. Rule 13: Share the road. There are a lot of other buses on life’s roads. Be a courteous driver. Rule 14: Don’t be afraid to take detours and the roads less traveled. They are rumored to make all the difference in the quality of our journey. Rule 15: Enjoy the trip! It’s a one way voyage to discovery. It’s the only one you have and it will end all too soon. There are probably many more rules for life buses. Feel free to share yours with me. I suggest you avoid the always under construction freeway that leads to success. It seems like you never arrive no matter how hard you drive. The way to satisfaction is perhaps a better exit to take. May you boldly go somewhere no one has ever gone before! Drive safely and have a great trip. I’ve not read it, but I have heard good things from those who have read it. 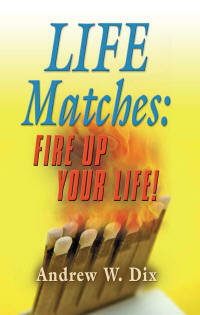 All of the author’s proceeds from the sale of “Life Matches: Fire Up Your Life!” are donated to CHADD, the national non-profit organization dedicated to helping people with AD/HD and their loved ones.